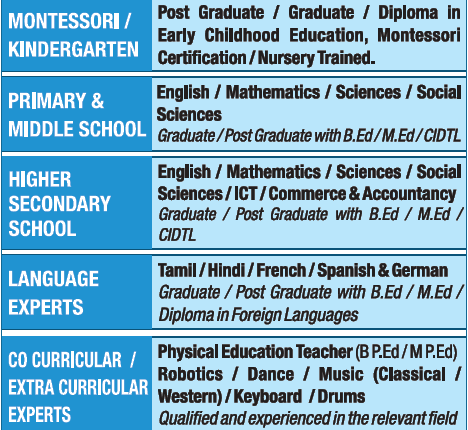 Hindustan International School, Chennai has advertised for recruitment of Teachers jobs vacancies. Interested and eligible job aspirants are requested to apply within 07 days from 02nd December 2018. Check out further more details below. About School: Hindustan International School (HIS) is distinguished by its unique approach towards learning and its commitment to providing quality education. Leveraging the best practices of both traditional and contemporary schools of education, we measure our performance by our student’s excellence in academics and co-curricular activities, in addition to developing an enduring interest in sports, performing arts and other extracurricular activities. How to Apply: Interested and eligible candidates are requested to apply online at the web address given below.